Note: While this guide focuses on ceramic rings, the information is relevant to any ceramic-based aquarium filter media. The ones that sit inside aquarium filters? Well, those are actually ceramic rings. 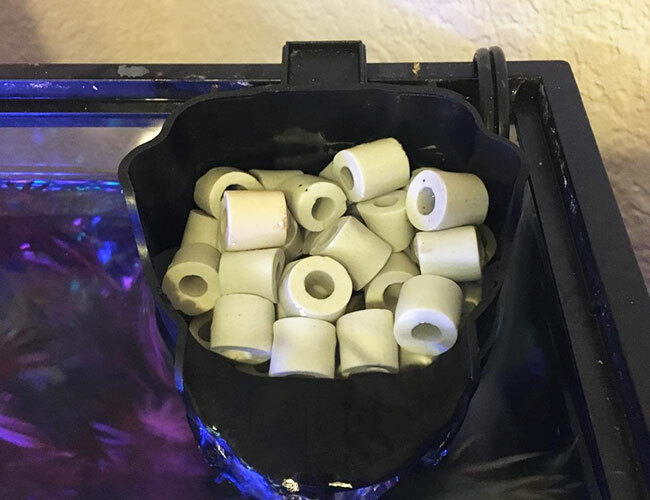 And when used properly, ceramic rings provide powerful biological filtration for your aquarium – keeping your tank safe from dangerous chemicals! Today, I’m going to teach you all about them. What are ceramic rings used for in your aquarium? How do you add ceramic rings to your aquarium? How many ceramic rings do I need for my aquarium? How do you clean ceramic rings? How often should I replace ceramic rings? How do I replace ceramic rings? Can I use ceramic rings inside my display tank? What are the alternatives to ceramic rings? Can I use ceramic rings in a saltwater aquarium? Sometimes referred to as bio rings, ceramic rings are unglazed pieces of fired ceramic. 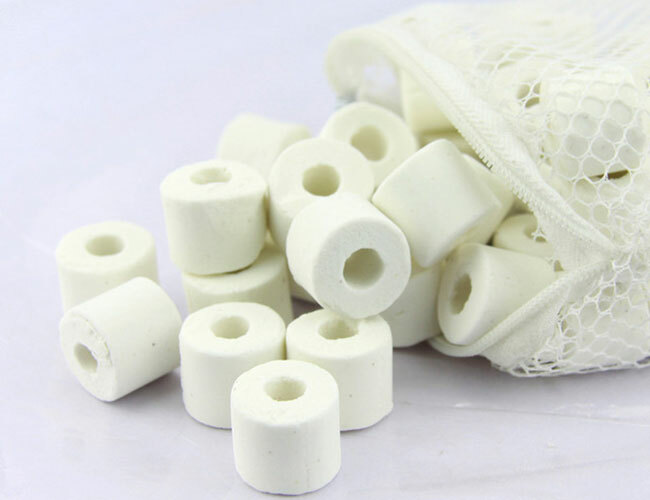 Most commonly, they resemble small white beads. However, they can also be found in other colors like cream, gray or brown. 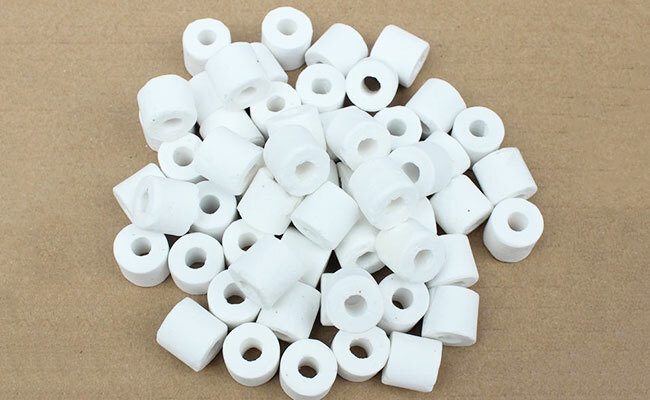 Ceramic rings are designed to have an outer part that has lots of small holes, or pores, and a central hole that goes through the entire thing. This way, water not only runs over the ceramic rings but through them as well. The left one is for eating. The one on the right? Shove it in your filter! 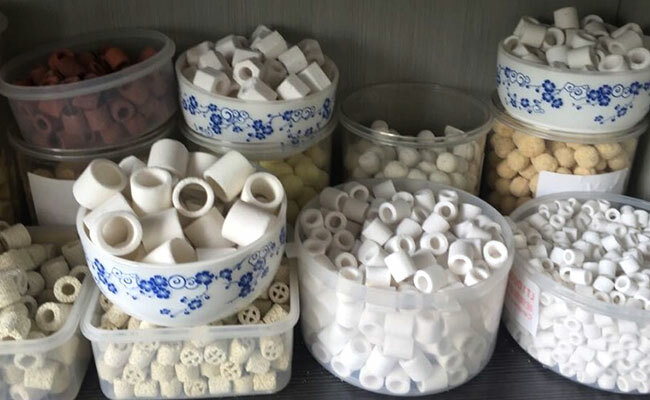 Confusingly, the phrase ceramic rings is often used to describe any ceramic-based filter media, regardless of the shape – round, square, even those without holes! If you think back to the nitrogen cycle, you will remember just how important nitrifying bacteria are. This beneficial bacteria removes ammonia and nitrites (harmful chemicals) from your aquarium. These chemicals naturally build up inside your aquarium, and if the bacteria in your tank don’t remove them, then your fish will eventually die. As you see, these beneficial bacteria are pretty important. Well, these bacteria need a place to live. Ceramic rings offer the perfect home for the beneficial bacteria in your aquarium. You see, beneficial bacteria need a surface to cling to. The more surface that is available, the more bacteria that your filter media can hold. It’s in these pores that the beneficial bacteria make their home. Important: Ceramic rings do not filter your water. It’s the beneficial bacteria that live in these rings that do the filtering. Any new ceramic rings you add to your tank will not have any bacteria on them. Properly cycling your tank will encourage beneficial bacteria to grow on your ceramic rings. These bacteria eat nitrates and will only survive where there is no oxygen present. 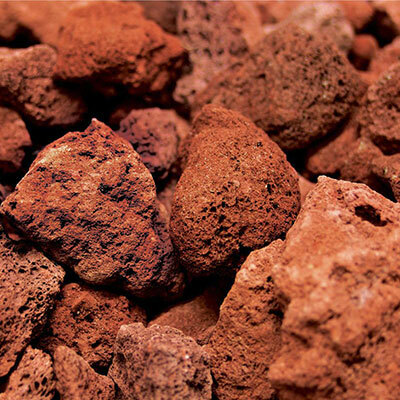 Denitrifying bacteria live deep inside rock, ceramic and other porous materials, where oxygen cannot reach them. You won’t find this bacteria in plastic or foam filter media. However, just because denitrifying bacteria help to combat nitrates, it doesn’t mean that you can skip water changes. Using ceramic rings couldn’t be easier! Simply add them to your aquarium filter. Many filter kits already include ceramic rings in the box. If your filter didn’t come with any ceramic rings, or you want to purchase more, grab some here or from your local fish store – they are very affordable. While some ceramic rings come with their own filter media bag, others come loose. It makes no difference in performance if you choose to bag your ceramic rings or not. I personally use a filter media bag since it makes it easier to remove the ceramic rings all at once, especially during cleaning. The first thing you want to do is rinse the rings in dechlorinated water. Doing so will remove any dust that built up from the ceramic rings rubbing together in the packaging. If you skip this step, the dust could cloud up your tank. Next, you want to add the ceramic rings to your filter. And, the location is important! You want your ceramic rings to sit after your mechanical filtration. Sponges, foam, filter floss, etc. 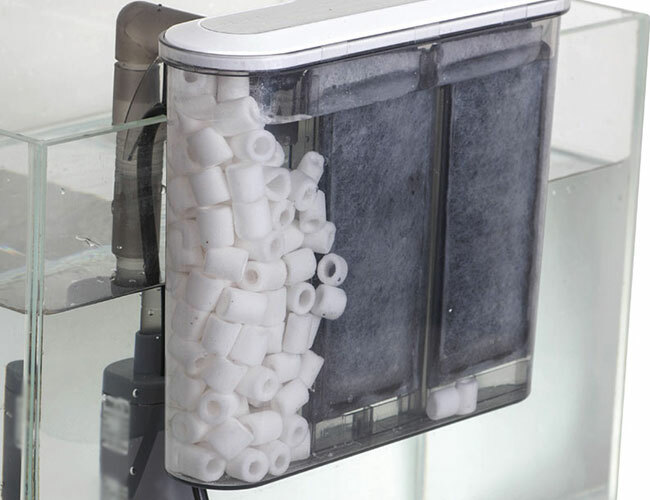 should be the first thing that water passes through on its journey through your aquarium filter. By placing mechanical filtration first, it catches any large particles such as fish poop, dead leaves and uneaten food, preventing your ceramic rings from gunking up. 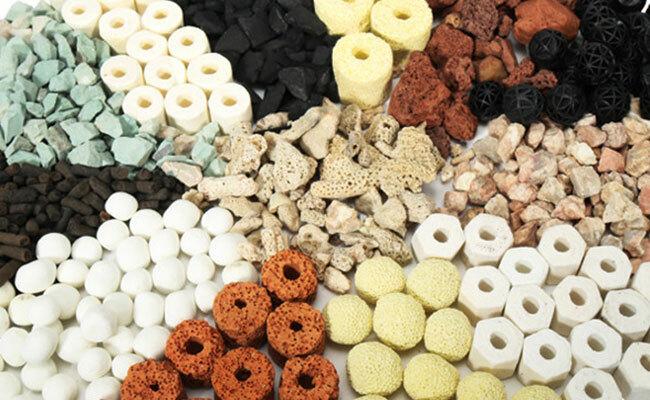 Similarly, any chemical filtration, such as activated carbon or zeolite should be placed after your ceramic rings. Important: Ceramic rings need to be kept submerged underwater at all times. The bacteria that live on the rings cannot survive out of water. This is a surprisingly common question that I am asked. Unfortunately, there is no set number – it all depends on the size of your aquarium. As many as you can fit in your aquarium filter. Filters are rated according to the size of your fish tank. Assuming you chose an appropriate aquarium, it should be able to fit all the ceramic rings you needed for good biological filtration. If you have room to add more, then do it! 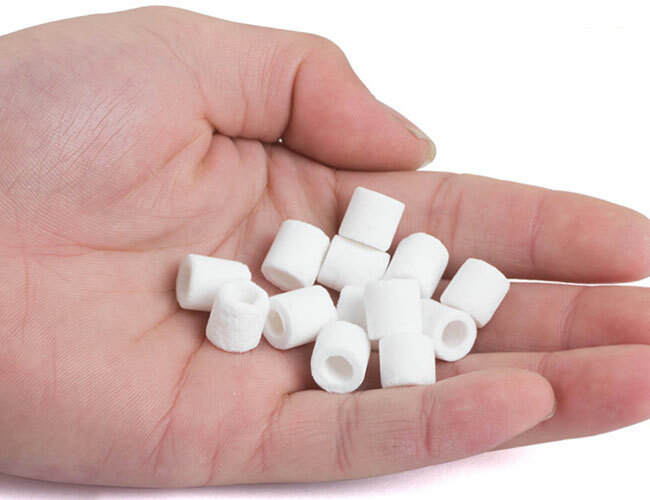 To provide effective biological filtration, it is important that water can easily flow around your ceramic rings. Over time, you may notice that your ceramic rings begin to trap waste and restrict the flow of water through your filter. If water cannot easily flow over your ceramic rings, then the beneficial bacteria that call them home are not going to be able to remove the nasty chemicals that are building up in your tank. Fortunately, ceramic rings are super easy to clean. The next time you perform a water change, add your ceramic rings to your bucket of siphoned tank water. Gently swish the water around to remove excess gunk. It is important to note that you are trying to remove any excess waste that prevents water from flowing through them. You are not trying to return your ceramic rings to the crisp, white color they were when you first bought them. If you do that, then you would remove the beneficial bacteria. Your ceramic rings will still look ‘dirty’ once you finish, especially if they have been in your tank for quite some time. Remember: Your ceramic rings are home to beneficial bacteria. These are living things! If you kill them, then your tank will need to be cycled again. Be careful and don’t expose them to soap, chlorinated tap water or scrubbing. Exactly how often you should swap out your ceramic rings is the cause of much debate. Even the manufacturers don’t agree! Fluval, for example, recommends that ceramic rings be swapped out every 6 months. Marineland, another ceramic filter manufacturer, states that the rings should never be replaced. I sit somewhere between the two. You see, your ceramic rings will eventually wear down. This is due to both the water constantly flowing over them and the ceramic rings rubbing against one another. As I touched upon earlier in this guide, your beneficial bacteria need rough surfaces to cling to. And if your ceramic rings become smooth, then less beneficial bacteria can to cling to them and break down the harmful chemicals. Now, don’t get me wrong. This entire process takes many, many years. One of my tanks has had the same ceramic rings (these ones to be precise) for nearly 3 years now, and my aquarium test kit reveals that my biological filtration is as good as ever. So unless your ceramic rings have worn down or are breaking into pieces, there really isn’t any need to replace them on a regular basis. Your ceramic rings are home to beneficial bacteria. Yes, I know I keep repeating it, but it’s important! You see… Your new ceramic rings will not have any beneficial bacteria living on them. Now, this presents a bit of an issue. If you remove all your old ceramic rings and replace them with new ones, you would also remove most of the beneficial bacteria in your aquarium. And without these beneficial bacteria, you will experience ammonia spikes, which can kill your fish. So, the trick to changing out your ceramic rings? Don’t remove all your ceramic rings at once. Take out half of your old ceramic rings and add half of the new ones. This is why I like to use filter media bags. They keep your old ceramic rings and new ones separate. What this does is encourage the bacteria to grow on your new filter media. This process is referred to as seasoning. Leave the ceramic rings for two to three weeks before removing the remaining old ceramic rings and adding the rest of the new ones. Make sure to keep an eye on your ammonia and nitrate levels throughout the entire process to ensure everything is going smoothly. An accurate aquarium test kit is your best friend in this situation. You can also use this method to speed up the cycling process. You see, ceramic rings in an established tank, meaning one that has already been cycled, will already be coated in beneficial bacteria. By adding these ceramic rings to a newly set-up aquarium, you can shorten the time it takes to cycle your tank. While it’s not common, you don’t need to place the ceramic rings inside your filter to receive their benefits. You see, established beneficial bacteria will begin to colonize your ceramic rings even if they sit in the main tank area. With that said, beneficial bacteria still need a constant flow of oxygen and nutrients to live. So if you want to go down this road, it’s a good idea to place your ceramic rings where they will have good water flow – such as directly under the outflow on your filter. With that said, I don’t recommend using ceramic rings in your display tank. Without the mechanical filtration before them, they will clog much quicker. Ceramic rings don’t filter your aquarium. They simply provide a home for the bacteria that do all the hard work. While there are other types of ceramic-based filter media, ranging from spheres to sticks, they all behave similarly to ceramic rings. As the name suggests, bio balls are round pieces of plastic. 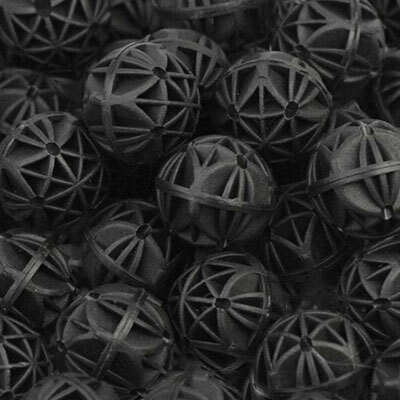 These plastic balls have been designed to provide beneficial bacteria with many different nooks and crannies to call home. Bio balls are typically used in larger tanks, refugiums and ponds, providing a cheaper alternative to ceramic rings. Want more info? Check out our bio balls guide! 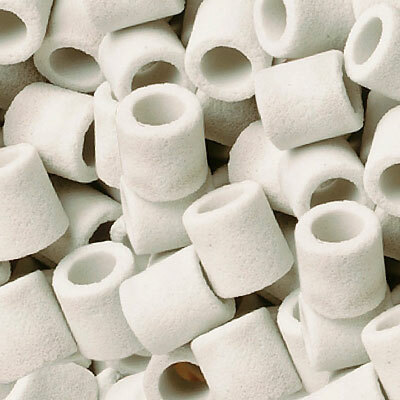 Sera siporax, which are very similar to ceramic rings but made from sintered glass, are small glass fragments that are heated and pressed together, leaving plenty of room for beneficial bacteria. Siporax has about the same capacity for anaerobic bacteria as ceramic rings. However, my personal experience is that it wears down slower and is much less prone to breaking. 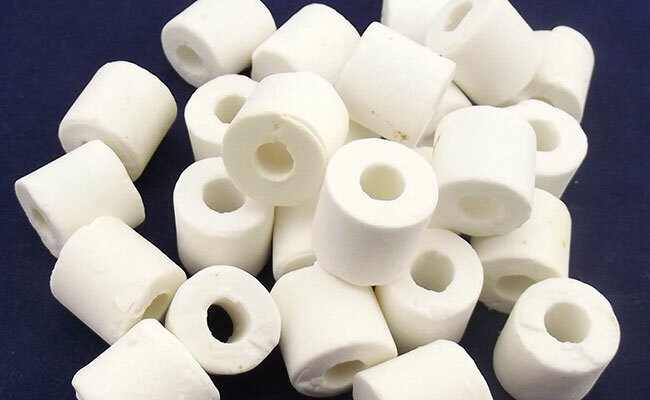 A natural porous alternative to ceramic rings. Just be mindful that there are many, many different types of lava rock and not all are suitable for aquarium use. You can either crush it up and put it in your filter bag or use it as a decoration in your main tank. Care should be taken if you use lava rock in your display tank because delicate fins can get snagged and scrapped. Yes, you can. In fact, ceramic rings’ ability to hold denitrifying bacteria makes it a tempting option. Despite this, ceramic rings are not commonly used in marine and reef tanks. This is because saltwater aquariums have the ability to use live rock – which has much more room for denitrifying bacteria to grow. Ceramic rings just can’t compete. Any space in a saltwater tank dedicated to ceramic rings would be better filled with live rock! Ceramic rings are one of the most popular methods of providing biological filtration to freshwater tanks. Every tank needs biological filtration and ceramic rings are cheap, readily available and long-lasting. Definitely a winner in my book. Do you use ceramic rings in your aquarium? Let me know in the comments below! What Are Bio Balls and Why Are They so Good for Biological Filtration? How to use activated carbon in your aquarium! Hey ian! Great article! So much information I’ve learned from it! I’m Currently doing my research to find the best biomedia for my planted aquarium. While surfing the web I came across Biohome ultamate. And seems to be the best thing to come into the aquarium hobby world. Yet there’s some things about it that don’t seem right to me. The fact that they state it removes nitrates? I’ve never heard of any filter media that can remove nitrates but a water change or atleast reduce them. To my belief I thought plants need the nitrates or at least some. Also that it can last anywhere from 10-12 years. Have you heard of this biomedia? And if you have is it a good choice for planted aquariums. Or are ceramic rings a better choice. Here is a statement from them. Thank you in advance. Hope to hear from you soon. To an extent, all ceramic biomedia can contain aneraobic bacteria. This isn’t a new concept and many brands use it as a selling point. But here is the thing: In a freshwater tank, in most cases, there isn’t enough room in your filter to store enough biomedia that will break down nitrates as quickly as they are produced. Besides, even if you could get nitrates down to zero, this won’t eliminate water changes as you still need to replenish trace minerals that are not naturally produced in a sealed aquarium environment. As for last-ability, Sintered Glass media lasts an incredibly long time. My Sera Siporax is going on 8 years old now in my tank, and that was an old box I found that is likely from the 90’s. It’s the aerobic bacteria that are most important, and for that, any old ceramic rings will do. However, some certainly do last longer than others. Your article is the most informative I’ve found on the internet so far. Now my question is, if you have 2 identical tanks with the same bio load, one with ceramic ring and the other don’t, will their nitrate level be different and how much ie: 80%, 50% or just 10% ? Not a black and white answer. In an aquarium, fish are not the only thing that produce ammonia. Over feeding, plants type of food etc. can all impact the rate at which nitrate is synthesized. To further complicate this, in the absence of rings, beneficial bacteria also inhabit sponge, substrate, anything porous really. I have an AquaClear 50 filter. I am trying to find bio rings/media the same size as the ones that came with the filter new. I ordered some and they were to large for my filter. They are at least 4 times the size of the original bio rings (stones is abetter description). Hagen, the manufacturer said the bio rings were not designed for my filter and said I could only buy their pre-assembled bio bags. I also ordered some mesh bags but they are to fine for bio material IMO. So they are going to be returned. Do you now where I can find bio-media that is the correct size for my AQ 50 filter? Can I use the mesh bags that onions come in from the grocery store? (It looks identical to what I have and am using. Only difference is the color). Or how can I find the correct material to contain my bio media? Why did you want to avoid the Aquaclear biorings? Is there a particular reason? I only ask as I know many fish keepers who have successfully used these rings. Sera Siporax makes a small version for HOB filters, I think it’s just called Sera Siporax Mini. These are a smaller version of what I use in my tank although admittedly I am unsure as to how small they actually are. As for your question, it depends on the material. If it’s made from nylon, then it could be aquariums safe. However, there is no guarantee any chemicals or dyes used in it’s manufacture won’t leak into your aquarium. The rule of thumb is that if you don’t know what’s in it, don’t add it to your aquarium. coarse filter media bags are the product you are looking for, these are designed to hold filter media, have wider gaps and only cost a few bucks each. Just be mindful they do come in a variety of sizes, so check and make sure the measurements match with what you are after. I’m quite new to fish keeping but my wife and I really wanted to get an aquarium just to keep community fish, we settled on a SuperFish 80 which on the stand fits perfectly in the space available, we’re purposefully under stocking about 24 fish in total and 8 shrimps (amano). I need to extend planting a little as the shrimps took a liking to 3 varieties and stripped them bear so I’m ‘re planting with the 3 they didn’t like 😉….we really enjoyed your reviews and the one relating to activated charcoal opened our eyes so we’ll be purchasing your recommendation. I’m unfamiliar with the SuperFish brand, I assume you are from outside the USA? It sounds like you are all over it, especially with your trial and error experience with your shrimp! Thanks for the kind words and I wish you all the best in the hobby. Warning: It’s very addictive. I have a 4o7 fluval with 4 trays .the bottom one has filter pads ,next is carbon ,the last 2 are filled with ceramic rings… What order should I have them? Rjk thanks! I have a Top Fin Silentstream 40 Power Filter and its chemical filter is built in the mechanical filter (the activated carbon is inside the filter floss). It also has a bio-cartridge which is placed after the mechanical/chemical filter. Will this arrangement have any affect on the nitrifying bacteria? Also could you explain why the chemical filter should be placed after the bio filter? Those 2-in-1 (filter floss + carbon) disposable filters are a bit of a scam and if you can ween yourself off them, you probably should. These things are designed to break down and not be reused, which is just poor since the filterfloss also houses good bacteria and you are disposing of these each time you toss the filter out, not to mention that replacing it continually is expensive. If you have room, my preference is always a dedicated sponge and ceramic ring combination, added to the filter seperately. You don’t need activated carbon – it soon clogs and is only useful for removing tannins, bad smells and certain medications – if you are properly maintaining your tank, activated carbon can easily be skipped. in the last couple years i had a pump change – normally never an issue – this one does have ceramic rings, which had been in place for at least 2 years. had been doing 4 – 5 weekly regular gravel filtering with 75% water change. Always nice to meet another passionate fishkeeper. I can imagine as a scientist you would love this hobby. After all, most of it comes down to, well, science! If I understand you correctly, you replaced your ceramic rings in an established tank? If so, it’s likely that you crashed your cycle. Without the beneficial bacteria to “filter” ammonia and nitrite, it would have spiked, which could certainly have caused the cloudiness which is commonly seen in new cycling tanks. I’d suggest buying an API test kit, it has every test needed to see out a cycle. I just had a look at the price in Australia and I’m pretty shocked, about $60. We pick them up in America for less than $20. Perhaps you have cheaper test kits under a different brand? Regardless, you’ll need to test your ammonia and nitrite in order to get a better understanding of where in the cycle your tank actually is. From here, your main priority will be protecting your fish, depending on the species, ammonia and nitrite tolerance of most fish is near zero. The solution is regular water changes or some water conditioners also “bind” these toxic chemicals. Ordinarily you would swap out half of the ceramic rings at a time then wait a month or so before swapping out the other half, this way the bacteria can spread to it’s new home without causing a crash. On the activated carbon, it doesn’t really do much except remove bad smells, tannin, phenols and certain medications. If you have driftwood or similar organics, then these can leach tanins and stain your water. This is the most common use here in America. I don’t see how it would help here. Also, be mindful that activated carbon can only “absorb” for so long. Typically you’ll get around a month of use before it needs to be replaced. It doesn’t take long for the tiny pores to clog. Don’t worry if you forget to replace it, it won’t leach back into your water. where good becteria resides, so how can the bacteria break the ammonia in nitrate in such a small time which takes just to flow through. I mean ammonia water keeps flowing from inlet of biomedia and goes out of biomedia with ammonia reduced. You are looking at it linearly. In practice, water doesn’t just pass through the filter and over the bacteria once. It’s continuous. Depending on the amount of ammonia and beneficial bacteria in a tank, it can take many many passes. This is why when cycling, the ammonia won’t drop for days or even weeks until the bacteria grow in a high enough number to remove ammonia and keep it at zero. A very informative article. In fact I have gone through a lot of your articles and they are well laid down. I am wanting to use this filtration system for a large pond of 200 x 200 feet dimensions. Kinds of RAS Farming. I shall be using two-three layers of mechanical filters first – very fine sieve net kinds, sponge, pebble (plenty) and then the biofilters. I don’t know if i am right or not. After going through your articles i am thinking of placing the Bioballs first with oxygen supply, then Ceramic Rings and in the last Activated Carbons. It from from here then the filtered water goes back to the pond. 1. What do you think, is the process flow correct. 2. By Bioballs the Amonia breaks to Nitrites and then to Nitrates (as i gathered from your bioballs writeup). By Ceramic rings you say it breaks Nitrites. My question is what does it break to these Nitrites. 3. Do I need to do something or put something on these media for the beneficial bacteria to grow or it will grow on its own. 4. Do I need to check the type of bacteria that grow in these colonies. Why this question because, it came to my mind that if good bacteria finds home in these media then likewise the harmful bacteria shall also find the home suitable. So how do i know what kind of bacteria is my biological filter carry. I think its been a long narrative sir. So I shall stop here adding that I really loved your articles and could understand a lot of things from your article and therefore am in a position to ask these questions. 1. I can only answer your question in regards to aquariums. I have no experience in aquaculture and farmed fish. First you need a mechanical filter, otherwise the biomedia will trap debris and gunk, leaving less surface area for the bacteria to cling to. 2. Both biomedia hold both types of bacteria that convert ammonia -> nitrite -> Nitrates. 3. The bacteria will appear there on it’s own through a process known as “cycling” look this up for more information. 4. There are bacteria everywhere. While these are beneficial bacteria, there will certainly be other bacteria that seem to have no effect on the tank. However, only a few types of bacteria are nitrifying, so these have been singled out as beneficial. I do not know any fish keeper who checks for bad bacteria. You mentioned that if we replace ceramic rings we will remove the bacteria. but doesn’t the sponge in my filter also holds loads of bacteria? You are correct. This article is about ceramic rings, so that is anything found in this guide refers to them specifically, in isolation of everything else. If you have both, then some beneficial bacteria will be found in the mechanical filtration (the sponge) but most will reside in the biomedia, in this case the ceramic rings. 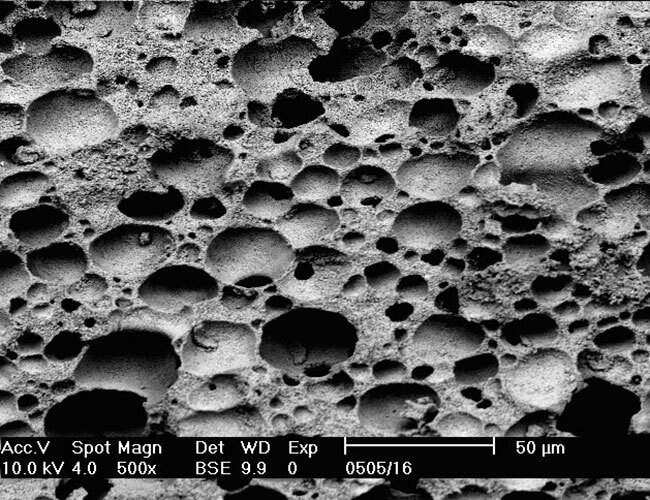 The amount a sponge will hold will generally depend on it’s coarseness and structure, but still should pale in comparison to the surface area of a good biomedia. Great article! Thanks! May I ask, I have recently bought a new filter as my old one has a minor leak. I have them both running presently to build up bacteria in the new one and will do so for about a month before removing my old one. Is there any benefit to adding the old bio rings to the tank substrate? I have a large log in the middle of the tank so they would be hidden and there is good flow in the tank. Some beneficial bacteria will hang out in the substrate, but as far as adding rings there goes, it will be of minimal benefit. You see, beneficial bacteria requires a surface to cling to and your substrate gunks up over time (it doesn’t have the same mechanical filtration your filter provides) so it likely won’t contribute a whole lot of biofiltration to your tank. However, I see no disadvantage to doing it, so it’s entirely up to you. Thanks for such a great article.It probably answered all my questions about the crematic rings.Thanks a lot. Thanks for the feedback. I’m glad you found the article helpful! Hi, would it be possible to put my rings in a bucket with a heater and air hose, and use bacteria in a bottle with ammonia to jump start my media??? I need to wait 30 days before my tank stand is made and shipped so would love to get a jump on my good bacteria. I think it sounds good but you are the boss on this one. Thanks for your time. It’s a crude way of doing it but it’s certainly feasible. 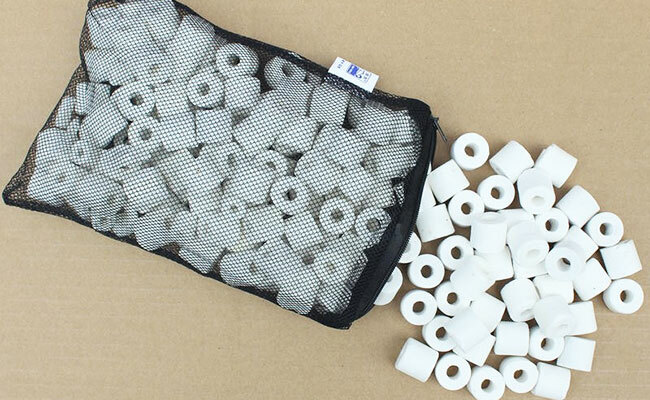 If you grab a filter media bag to keep the ceramic rings together and place them over an air stone from your air pump this will generate current through the rings which will allow the beneficial bacteria to filter the water as it passes over them. From here you would just need to monitor your water parameters as per a usual fishless cycle. It’s worth mentioning that this is how many fish keepers keep their beneficial bacteria alive during a power outage, when the filter no longer works – with a portable air pump. Hi! We’re trying to establish a 10gallon tank with an HOB filter with stuffed filter floss and ceramic rings. My friend insists that the arrangment of the filter floss and the ceramic rings don’t matter and placed the ceramic rings right under the entrance of the tank water into the filter and stuffed the remaining section where the water flows out with floss. The occupied volume ratio is 1:2 ceramic rings to filter floss. I really want to switch the placement and the ratio but they insist that it shouldn’t matter. We have white bacterial bloom but no conversion of ammonia to nitrites. Am I being too paranoid that the bacteria is not properly adhering to the media because it’s clogged? Should I just be more patient? And does the arrangement of filter media in HOB filters really not matter? Filter media arrangement certainly does matter. While the arrangement won’t affect your cycle at all, it’s less than ideal. The ceramic rings will trap gunk and need to be cleaned on a regular basis. Just how quickly they accumulate gunk entirely depend on what you have in your tank, but as they clog, it will inhibit the amount of oxygen that can flow over the beneficial bacteria which can result in a die off. Not only that, but if not removed trapped gunk will further decay, which can need to faster rises in nitrates. Filter floss is a particularly fine mechanical filter. While it can be used as the primary mechanical filtration, it will clog quicker than say a coarser sponge, which can inhibit water flow through your filter. Many people use a coarser media before filter floss to trap the big stuff while filter floss takes out the fine particles leaving your water crystal clear. 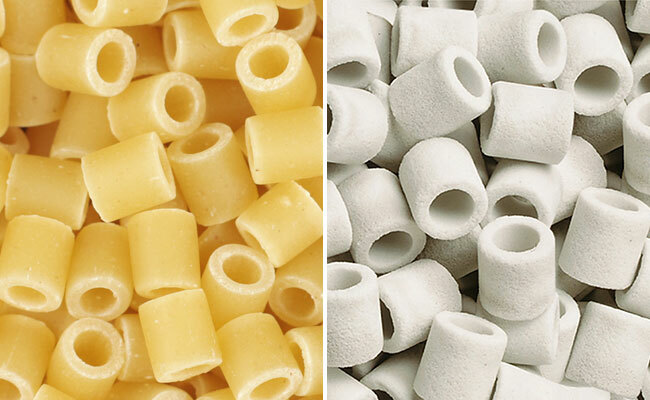 If you have no room for an extra sponge inside your filter, you can always look into pre-filter sponges. Coarse Filter Media, Filter Floss, Ceramic Rings. While you can skip the coarser sponge, you will have to make sure you are on top of your maintenance routine and regularly rinse your filter floss. You are professional and thank you so much for this article really good, and i have a question : JBL.de has many different ceramic rings and they have a product that is named JBL Sintome. It absorbs NH4 and No2 and another product Micromec absorbs Nh4 No2 No3 so what the differece and why doesn’t Sintomec absorb No3. For me I recently bought Micromec but if Sintomec doesn’t absorb No3 its better for my plants, can you tell me is it real what they said or just another product to sell and thank you so much? Unfortunately, these two products are not available in the US. However, the bacteria that breaks down nitrates are anaerobic, meaning they live where there is no air. Deep inside rock and filter media. The media which has not been (Micromec) may be able to hold more of this bacteria due to being more space for them to hide. The reality is that while this media may help remove some nitrates, you’ll still have to perform regular water changes – it’s not going to drop your nitrates down to zero. In freshwater tanks, most fish keepers just use regular ceramic rings, in this case it would be Sintomec. If you run a planted tank, test your water. If you still see nitrates there, then this ceramic media shouldn’t cause any issue. really nice article Ian, thanks very much for the informations provided. Also I was wondering, do you think one could use ceramic ring filter for human drinking water ? Ceramic aquarium rings are designed for bacteria to grown on. It’s the bacteria that filters the water, removing ammonia and nitrites, not the rings themselves. I personally wouldn’t use them as a filter for drinking water. Thank for so very much. A very informative article. Answers everything I could think asking in relation to ceramic balls. Thank you for the lovely feedback. I’m glad I could help. Thank you so much for the article. Very informative. I’m using a lot of ceramic rings for my filtration needs. There’s one product that I came across the internet. It’s called biohome. It’s made of sintered glass. Would like to ask for your opinion regarding this product. Is the product worth the hype or ceramic rings will do just fine in doing filtration? I have no experience with Biohome but I currently use Sera Siporax in my tanks and have been incredibly happy with it – it’s also made of sintered glass. However, just like all ceramic rings are not created equally, I doubt all sintered glass media is created equally and I would be hesitant to recommend a product I have not used. Thank you for the lovely feedback. Is this what you were looking for on activated carbon?